STONEHAM, MA: At the request of the Prime Minister of India, Akshaya Patra is participating in India’s efforts to provide emergency aid to neighboring Nepal, which suffered a 7.8 magnitude earthquake on April 25. Akshaya Patra, with the support of the TATA Foundation, is building a field kitchen facility in Nepal to sustain emergency meal distribution efforts. On April 29, Akshaya Patra prepared 100,000 meals of pooris, chana, makhana, pickles, biscuits, and cakes for survivors of the earthquake. In addition, Akshaya Patra has sent 220 lbs of shakkar pari, 882 lbs of roasted chickpeas, and 220 lbs of individually packed units of jaggery, 4409 lbs of puffed rice. The meals were prepared in Akshaya Patra’s mechanized kitchen facility in Jaipur, Rajasthan, and shipped in Akshaya Patra’s meal distribution vehicles to Delhi. The meals were then air-lifted from Delhi to the relief site in Nepal. With the support of the TATA Foundation, Akshaya Patra will begin building a field kitchen to continue to provide meals to survivors of the earthquake. The proposed kitchen will be able to produce 10,000 meals in each preparation cycle with a total daily capacity of 100,000 meals. Akshaya Patra’s Jaipur kitchen is one of 22 mechanized kitchen facilities that provide daily school meals to more than 1.4 million children in government schools across India. Akshaya Patra’s founders used their own knowledge of engineering to design immense mechanized kitchen facilities capable of preparing meals for 100,000 children or more every day. Akshaya Patra’s custom chapatti machines can bake 60,000 chapattis per hour and easy-tilt cauldrons can produce 1,200 liters of rice or sambar in just two hours. These technological innovations optimize quality and minimize cost, time and labor to ensure that the meals prepared are safe, fresh, and nutritious. All of Akshaya Patra’s kitchens meet the highest standards of safety and efficiency, and ten of Akshaya Patra’s kitchens have already been certified as FSMS ISO 22000:2005 compliant, which means they meet the standards of the International Food Safety Management System (FSMS). The International Organization for Standardization established the ISO 22000 certification to ensure the safety of the global food supply chain. 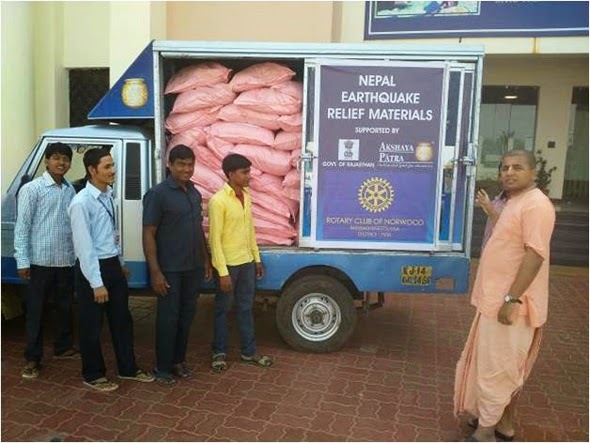 Akshaya Patra has provided aid relief after natural disasters. In 2012, Akshaya Patra prepared 50,000 meals for survivors of floods in the Bhatta Basti, Shastri Nagar, and Jahawar Nagar areas of Rajasthan.